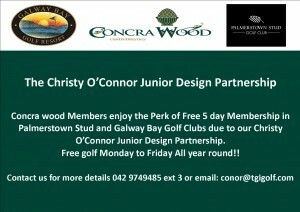 Concrawood Golf Club Membership is open!! Here at Concrawood Golf Club Ireland we have several different types of membership available. 2019 Membership Now Open! Call the office today 042 9749 485! Perks of being a Concra Wood Member……. Anyone who owns a share in Concra Wood Golf Club is entitled to full membership. Up until th age of 65 it is €800 per calendar year. 65 and over is €610. Any adult that lives less than 50km as the crow flies and does not have a share in Concra Wood can avail of Associate membership. €1200 per calendar year. Beginner (Female) Year 1 €250 per person/ Beginner (Male) Year 1 €350 per person. Beginners will be permitted to use the course everyday of the week except on members allocated times on Saturday and Sunday mornings. Beginners will be able to work towards getting a handicap (they must not already hold a current GUI/ILGU handicap) and cannot attain a handicap until the end of year one. Beginners will not be eligible to play in Castleblayney Golf Club competitions in year one. Year 2 (Female) €400 per person / Year 2 (Male) €600 per person. Beginners in year two will have no restrictions to playing times once they have achieved a full playing handicap. Year 3 Full membership fees apply. Our Overseas membership is now available. To qualify for our overseas membership you must live outside the island of Ireland including Northern Ireland for the majority of the year. The cost of Overseas membership is €250 for the calendar year. Student membership is available from 18 -23 years of age. A student ID card will need to be presented to show you’re in education if over 18 years of age. Membership is €300 per year. Junior membership is available to those under the age of 15-18 and are still attending education. The cost of Junior membership is €200 for the calander year. To qualify for our Juvenile membership you cannot hold a handicap in any other club and this is only available up to the age of 15. If you do hold a handicap in another club you can still join but as a Junior member. The cost of Juvenile membership is €75 for the calendar year.